The 2006 Malaysian Grand Prix looked like being a really interesting race but as things turned out, it was not a classic. The early demise of Williams and Kimi Raikkonen and the lack of performance of others meant that Giancarlo Fisichella had things pretty much how he wanted them. The only threat came from Jenson Button and his efforts were hobbled this time by having to deal with traffic. And by the end Jenson had to admit once again that the Honda is just not quite there with the Renaults. 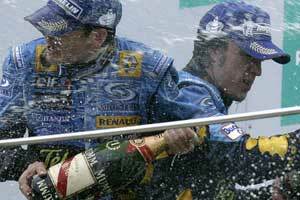 No-one else was either and by the end of the day Fisichella led home Fernando Alonso. Do not be confused into thinking that this was a straight fight, however, because Alonso was fighting with one hand behind his back following a screw-up during the qualifying sessions on Saturday when Renault's refuelling machines decided to misbehave and dumped a bunch of fuel in Alonso's car, and then forgot to tell the team it had done it. As a result the Renault men refuelled him again. By the time they realised the mistake it was too late. Alonso had a weight handicap he would drag with him for the rest of the event. He qualified only seventh and then spent Sunday catching up. The Renault engineers came up with a decent strategy to run one long stint at the start of the race and then two fast stints after that to catch and pass whoever they could. It worked a treat and the only person left to catch by the end was Fisichella. The key to this strategy was a good start and Fernando certainly had one of those as he powered off the line, the heavy fuel load and Renault's fancy software giving him traction that the others around him could only dream of having. In a flash he was ahead of the two McLarens and the two Williams-Cosworths that had shared row two were too busy sorting out each other that they paid little attention to the flying Alonso. In fact Mark Webber had little choice as the precocious Nico Rosberg tried to impose his will and pushed Mark off to the right. Webber not about to lift off for some schoolkid and so by the time they got down to the first corner Nico had to give. Ahead of them Fisichella was already gone and Alonso was second. Webber turned in third and Rosberg found himself in the grip of various McLarens, Red Bulls and BMWs. At Turn Four that sorted itself out when Montoya, Raikkonen and Klien all tried to go into the same apex. "I was right on the inside," said Klien. "I was already up on the kerbs and I couldn't go further to the right." From Raikkonen's forward-facing in-car camera there was no-one else in the shot and so one must assume that Kimi was ahead. Klien hit the back of him and perhaps Montoya took to the dirt on the other side. Kimi seemed to have got away with it for a second or two and then the McLaren snapped into a spin and went off into the wall backwards. It was all over for him. This was not good for the race because we were expecting great things from McLaren. Worse was yet to come. Rosberg ended up behind Nick Heidfeld but soon took advantage as Nick made a mistake at the final corner to grab back the place but within a couple of laps Rosberg's Williams suddenly decided it needed to have an afterburner and an exciting flash of flame signalled with much smoke that the V8 from Northampton had gone to that great dyno in the sky. Nico pulled off, parked neatly on the grass verge, tidied his hair and headed back to the pits. Webber would follow not long afterwards but before that happened we had a rather early pit stop. Pitting after 14 laps was an indication that Williams was not really running a great deal of fuel. We knew Fisichella and Button were running light but Webber must have been lighter still, although perhaps the team decided to pull him in earlier than planned because he was being held up badly by Alonso at the wheel of the Renault tanker truck. In the circumstances Webber's hopes of glory evaporated rapidly as the plan had been to be up at the front with Fizzy and Button and not cruising along nearly 20secs behind after 14 laps. Whatever the case, Webber tumbled down the order to 10th and then a lap later disappeared with an hydraulic failure. The Cosworth underdogs were gone and with them went the makings of a great story. Some suggested that the apparently brilliant qualifying was a PR stunt but one cannot imagine Williams doing such a thing. More likely it was strategy that went wrong. From then on there was little of interest at the sharp end. Fisichella and Button turned out to have only a few more laps-worth of fuel: Fisichella stopped on lap 17 and Button on 19. That left Alonso leading until his stop on 26 and then it was back to the same order as before because fourth-placed Montoya was nowhere at all in that first stint, his tyres graining for some reason (which may have had something to do with the adventures on lap one). Heidfeld was charging along in his BMW and behind him, at a distance came Trulli, who had suffered damage from someone on the first lap and was struggling. Michael Schumacher looked as threatening as a sleeping cat as his Ferrari seemed ill at ease on its tyres. Those further back, recovering from qualifying penalties	and so on, did little to make an impression. Felipe Massa did the best job riding from 21st on the grid to fourth by lap 29 when finally he stopped for more fuel. He was one-stopping. So too was Rubens Barrichello but his plans were ruined by speeding in the pitlane, which lost any advantage that might have gained. Klien's race was effectively over from the crash although he did reappear briefly and David Coulthard was soon gone too with an hydraulic problem. The Toro Rossos were handling like haywagons, Scott Speeds car seemingly slightly better than Tonio Liuzzi's and the Italian also being an early visitor after a brush with Villeneuve on the first lap. All in all the chasers seemed a rather lacklustre lot. The one chance that Button had was to close up on Fisichella during the period after the first stops but when he came out of the pits he found himself behind Montoya for four laps. After that he could chase and close up on Fizzy but he couldn't pass. In fact Alonso was closing in behind him. He might have stayed ahead of Alonso at the second stops but at a critical moment he found himself stuck behind Scott Speed who seemed to be cruising along, humming the Star Spangled Banner no doubt, and that put paid to any ambition. When the pit stops were done Button was third. Montoya was fourth and the two Ferraris were next Massa leading home Schumacher in a sight not seen for a year or two down at Ferrari. Villeneuve survived behind them, worrying no doubt that Heidfeld, who had been heading for fifth place, disappeared with just a few laps to go in a cloud of smoke of which a battleship would have been proud. Ralf Schumacher ended up with the final point, awarded for perseverance rather than speed. A classic race it was not but it was nice to see Fisichella up on the top step again. For once someone else had the problems. But one has to wonder a little at the logic of a system in which a race can be so obviously won and lost on a Saturday afternoon. We think we know a little more now about the cars of 2006 but when we go to Melbourne two weeks from now the temperatures will no doubt be lower and the pack may get shuffled again. And, of course, there may be some impact resulting from a great deal of scurrying around the paddock on Sunday morning as teams worked out a deal to avoid embarrassment over some controversial wings that Ferrari has been using to date. Apparently we will not be seeing them in Australia. And what will that do to the performance of the red cars? Tune in for Episode Three.